The final set of assessment relates to transferable skills and may be harder to quantify objectively, but should rather be reviewed as subjective comments to the individual. These include interpersonal skills, group working, public communication etc. Rather than comment on these directly within the passport, it is useful to note them and provide informal guidance. There are also the skills that relate to skillsets that can be easily documented, such as driving licence, first aid training, Health and safety courses and CSCS qualification, which once gained are recorded as either present or not. Transferable skills are general you can use in many jobs. 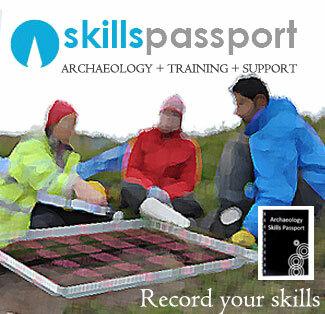 You gain these skills from previous projects, voluntary work, sport, hobbies, and interests. They will enable you to be adaptable and flexible in case you need to change your job. How well can you talk to others and explain what you are doing. Can you make sure you keep your daily spend on budget? How well do you care for and about others? Can you write diary entries, blog articles and context descriptions? Archaeology takes both of these to achieve. See how well you can understand the stratigraphy of a site. Can you instruct and inspire people? When the rain is coming down, it is easy to give up. Don’t! What makes a good project is the team. Be part of it. Turn up on time, and work on finishing a feature in a set timelimit.